Get a full Grammarly Premium account set up for you. Every participant has a fair chance to win and can increase chances by three different easy ways. Open worldwide and no purchase necessary to enter. Every participant will have a chance to win Grammarly Premium in every month! Why Grammarly grammar checker is best for you? How can Grammarly help you overcome simple to complex grammar and punctuation mistakes? You are going to find answers to all of these questions in this Grammarly review! You are a blogger and want to know how Grammarly is the perfect match to write errorless blog posts even English isn't your mother language. You are a freelance writer who writes for others and wants to know how Grammarly can save time, money and efforts while helping you fixing grammatical errors. You are a digital marketer and want to know how Grammarly can help to check grammar errors on your marketing proposals, emails, and professional letters. You are an online marketer and want to know how Grammarly can improve your marketing copies by improving grammar and adding proper punctuation marks in the right places. You are a daily-internet user and want to help with correcting grammar on your social media posts and comments when you are online on desktop or mobile. I corrected improper grammar and improved this Grammarly review 2019 blog post (and tons of others) with the help of Grammarly grammar checker. I never review products or services that I don't use. This review for Grammarly is proofread by Grammarly. Essentially, Grammarly is a writing tool with different tool-set. It does lots of things from simple grammar checking, comma checking to advanced plagiarism checking. Grammarly spell checker tool has the ability to check complicated words and find misspellings based on the context. Here's a misspell in this article. Grammarly AI Assistant will automatically find and highlight misspelled words on your documents and suggest correct version with explanation. This screenshot shows Grammarly's suggesting spell errors on this Grammarly review. Most common reason many people use Grammarly is to check grammar errors. Grammarly is capable of fixing over 400 small to advanced grammatical errors. Grammarly's Punctuation checker is capable of checking and fixing almost every english punctuation errors! And the best thing is you are given reasons in a box why there should or should not be the specific punctuation mark. Check comma placements and other punctuation mark placements with Grammarly. If you are a blogger, content marketer or a SEO, you know the importance of unique content. Duplicate content will lower your SERP (Search Engine Result Page) rankings and drastically discourage visitors from seeing your site for obvious reasons. If you have a Grammarly Premium subscription account, you will be given the plagiarism checker tool. Check Plagiarism (copied content) with Grammarly. Essentially, when you have a Grammarly Premium account, you will save more money which would have been spent for a plagiarism checker tool. In fact, there are a LOT more tools such as synonym finder in Grammarly. I will talk more about them later in this updated 2019 Grammarly review. If you have a particular question you'd like to ask about Grammarly or would like to share your own Grammarly reviews, please do share them in the comments bottom of this Grammarly review article. Here is the table of content of Grammarly review. Use the links in the table to jump to each section respectively. How to use Grammarly on Chrome? How to use Grammarly in Word? How to use Grammarly on Mac? Why is Grammarly processing your data? Does Grammarly work on mobile? How does Grammarly Insights work? Is there a Grammarly free trial? How much is Grammarly accurate? Does Grammarly work with Good Docs, Word, Scrivener, etc.? I am using Grammarly since 2015, and before that, I used Ginger and not satisfied with its ability to detect grammatical errors and sentence structures. Once I moved into Grammarly grammar checker, I felt the powerfulness of this simple writing tool and how it could save me more time without losing the effectiveness of my work. So, this Grammarly review article contains more Grammarly features based on the Grammarly Premium. However, the free version of Grammarly can also fix basic grammatical errors. If you want to get Grammarly Premium for free, sign u​​p above to win Grammarly Premium for one year. Grammarly is a writing enhancement platform developed by Grammarly, INC. Max Lytvyn and Alex Shevchenko founded Grammarly, Inc in 2009. If you are wondering how much you can trust Grammarly, please check the table below that demonstrates the history of Grammarly grammar checker in brief. Plagiarism-checking tool for universities called MyDropBox founded. 300,000 students became registered users and 250+ universities as customers. Launched its free browser extensions for Google Chrome and Safari and switched to freemium consumer model. Launched Grammarly extension for Firefox after hugely popularity over Chrome extension. Grammarly’s free Chrome extension alone had over 8 million active users and more than 8 million downloads on the Chrome Webstore. Over 10 million daily active registered users. Go beyond contextual grammar checking with Artificial Intelligence. As you see, Grammarly is going to become a fully AI-powered reliable and accurate grammar checker. Grammarly.com supports its app for various platforms and browsers. Here is how to use Grammarly properly. There are two main ways to use Grammarly in Google Chrome web browser. Grammarly Editor is a distraction-free tool to write your articles, essays, blog posts etc. Create your free Grammarly account and login into get access to your Grammarly Editor in Google Chrome. Click on the "New" box to add your new content to proofread. Your article will not be proofread until you click on the "Start Assistant" button. Grammarly Assistant will scan every word your article in real-time and suggest corrections to improve your content. You can also set "Goals" to convey Grammarly Assistant to for whom your article is written and what purpose etc. Check the screenshot below for instance. It would be tedious and time-consuming if you would have to use Grammarly Editor every time you want to check grammar and punctuation of a chunk of text. Luckily for you, it's so much easier to check grammar on your WordPress post editor, Facebook comments, Twitter posts and anything there's a field for adding text! First of all, login to your Grammarly account over here and then install the browser extension on Chrome Store. Grammarly Chrome Extension: Check Grammar on-the-go! Enable checking grammar and spelling on specific websites. You can use this option to disable checking grammar by Grammarly on certain websites too. For example, I disable Grammarly grammar checking on sites such as Clickfunnels, UpViral, etc. Because sometimes, it's not compatible with some web services. Enable or disable displaying synonyms (similar words) via Double Clicks. This option cannot be enabled or disabled in the site-level. Create a new document in Grammarly or visit your Grammarly dashboard. Now, when you type something on a website, Grammarly will check your grammar, spelling, punctuation and improve your content in real-time. Using Grammarly extension for checking grammar, spell and punctuation errors of a sentence. Click on the Grammarly icon on the right-bottom to open Grammarly Editor overlay box. The Grammarly browser extension is available for Google Chrome, Mozilla Firefox, Opera (*), Safari and Microsoft Edge. The Grammarly browser extension is a big part when comparing with other grammar checker tools. I have never used other grammar checking browser extensions. But according to user reviews, Grammarly is one of THE best tools out there. Grammarly offers native Microsoft add-on for Word. You can download it on your Grammarly account. Grammarly add-on for Microsoft Office package is free to download, and you should have an account to start using. Grammarly provides software for Mac users. You can download Grammarly for Mac over here and install it on your Mac to start using Grammarly without using a web browser. Recently, Grammarly introduced the support for Google Docs. Although as of writing this Grammarly review 2019 in March, Grammarly for Google Docs is still in Beta. Learn more about Grammarly's Google Docs integration. First of all, you'd have to turn on the grammar checking on Google Docs by Grammarly by clicking on the Grammarly extension. After that, you can start checking grammar, spelling, and punctuation with Grammarly extension. You can install Grammarly Keyboard app for Android and iOS to get started using Grammarly on your mobile. As a dedicated tool for writing purposes, this tool supplements different sides of writing such as spell check, grammar check, vocabulary enhancement, proper wording, punctuation check, and plagiarism check. Also, Grammarly provides several tools and plugins to find and correct grammar errors you made in everywhere. So here are a few key features I found that stand out Grammarly from other online grammar checker tools. You may want to check grammar on a paper. Or you may want to find advanced punctuation and grammar on a formal letter to your CEO. There are lots of use cases where you want to use Grammarly grammar checker. Once you provided necessary details, Grammarly Assistant would start optimizing your content for the right people. After you logged into your account, you can see a similar interface like this. Unlike other grammar check tools, Grammarly has its unique interface that motivates you to write quality articles. One thing I most like is its distraction-free writing interface. Within this tool, you can write articles and blog posts seamlessly. Grammarly will save every word you occasionally type, so you don’t miss or lose any word mistakenly. If there is an internet connection error, Grammarly Editor will automatically notify you about that. This tool is handy if you travel often. As Grammarly works on both desktop and mobile devices, you will also get a huge benefit out of it. Many of online punctuation and grammar checker tools I have used don’t specify and define the reasons why the particular letter or word is incorrect. They just simply add a red, blue and a green underline for each grammatical, spelling and punctuation errors. But, Grammarly provides the reasons why the particular letter, word or sentence is wrong or inappropriate. Check this image for an example. And if you want to know more about this error, you can click “more” link and learn about the particular grammar rule. In fact, Grammarly is not just a proofreader, but also an online English teaching tool too! If you don’t want any particular word to regard as a wrong word, you can easily add them to the library. This function is helpful in many occasions such as when you want to a particular noun to regard as a correct word. For example, many spelling checker tools detect my name “Chamal Priyadarshana” and my blog “Pitiya” as incorrect words. However, you can add them to your 'Personal Dictionary' so that next time, they won't be marked as misspelled words. You can always visit your personal dictionary through Profile >> Personal dictionary. Your Grammarly Personal Dictionary: You can see added words or add new words to dictionary and remove any existing one. If you asked me one question why I love so much for this proofreading tool, I could certainly say that it is because of the powerful plagiarism checker of Grammarly. The content uniqueness or originality of content is one of the most important factors you have to consider when publishing an article on the Internet. If the information is not unique, we will only see stolen content everywhere on the internet: the same articles, same songs, same picture. The list goes on and on. When is the last day you saw a similar article twice ranking higher on SERP on two separate domains? Probably 10 - 15 years ago? One reason why Google started the Panda update is to remove thin and duplicate content from SERPs. Today, duplicate content is a big reason why Google panda punishes websites. With the Grammarly plagiarism checker, you can easily find the originality of your articles. For example, check out the screenshot below. 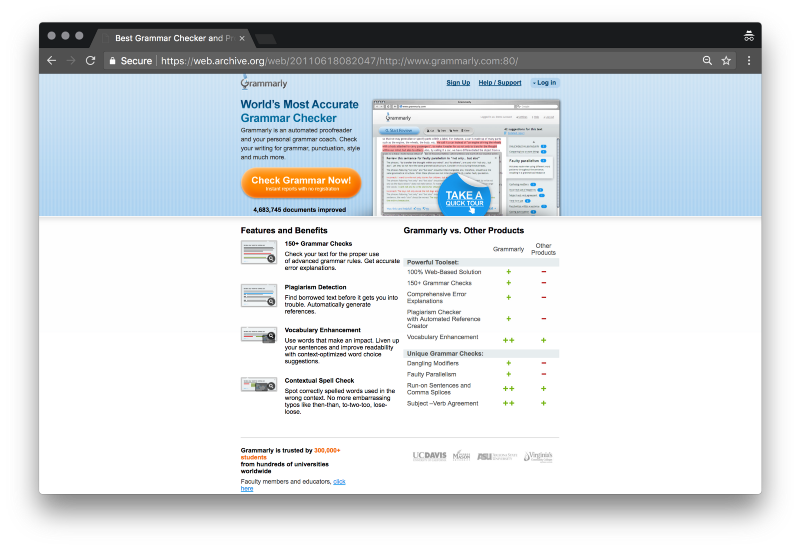 A months days ago, I wrote and published an article about the best online grammar and punctuation checker tools. I checked the grammar, punctuation errors, and, of course, the plagiarism with Grammarly when I first wrote the article. That day my article was a 98% unique article. (Just about 2% content unoriginality ratio) Despite some quoted texts, all the content of that article was 100% original, written by me. But, a few days later, I opened that article doc on Grammarly and checked for plagiarism. Can you guess what the plagiarism score was? As you see, the Grammarly plagiarism checker tool is so powerful. The amazing thing is that the post I published is only a few days old. That means Grammarly plagiarism checker checks for unique and duplicate content in every day. It is a similar tool to SEMrush. SEMrush also updates its database daily. You would see not only the percentage of article unoriginality but also the source(s) where the similar content located. As I expected, I could see the original article URL: https://www.pitiya.com/online-grammar-checker-and-punctuation-checker-tools.html. Plagiarism tool of Grammarly is handy, especially for bloggers, content marketers and freelance writers. This tool also can be used to find content thieves. Pro tip: Copy some text from one of your blog articles and check for plagiarism. If you found one or more duplicate references, you can contact the webmaster and request to remove duplicate content. If they don’t reply you back, you can email again after a week. Even if you don’t receive a response, you can go to this page and put a DMCA complaint. As a non-English native speaker, I always try to learn new English words. Add more words to my English vocabulary. If you use Grammarly as your vocabulary builder, then you do not need to worry about learning new words, ambiguous words and meanings of compound words. I didn’t think that I can improve my English vocabulary with Grammarly. I used a program to find the meaning of English words (English-Sinhala translator). So, I double-clicked the unknown word to copy it. After that popup, I was very curious to know about this vocabulary tool. So, I double-clicked another word randomly. … Improving English vocabulary is more straightforward with Grammarly. Unlike 10-20 years ago, you don’t need to use big books to learn English vocabulary. Grammarly will help you to improve your English vocabulary through definitions, synonyms and examples. Within a short period, I learned lots of things. So, you too will definitely. When selecting any product to use, the price tag is very important. If you selected the free plan, you could use online Editor, browser extensions and Microsoft Office Addon to proofread your articles. But, some features of your account will be limited. You won’t get the access to plagiarism checker, vocabulary Enhancement and professional proofreader to find and fix over 400 types of errors. If you selected the premium plan, you would get the unlimited access to use all the existing tools, and new features Grammarly introduce in the future. Here’s the pricing table of Grammarly grammar checker. If you read this Grammarly review 2019 from start to this point, you'd find that I have reviewed all features of Grammarly Premium, not the free version. The reason for it because Grammarly Premium is worth it and it saves me more time while giving the best results. Time is precious for me, as a businessman so that I can always subscribe to a robust, useful product or service that I will use regularly. Grammarly is one of THE top tools I use on daily so that I subscribed to Grammarly yearly plan with huge Grammarly premium discount. Grammarly free or Grammarly Premium? Here is a comparison of Grammarly free vs Premium. However, if you only want to check critical grammar and spell checks, it's sufficient to have a free Grammarly account. But, don't expect much better results with the Free plan. Grammarly has found that Premium customers are getting better results and they are improving their grammar day by day with Grammarly Premium. Is Grammarly Premium worth the money? Well, it depends on your needs and requirements. For example, if you are a student and want to know if Grammarly Premium worth it for students, then you have to decide how often and for which tasks you'd want to use Grammarly premium. If you only want to use Grammarly for a one-task job such as checking grammar in your essay, then purchasing Grammarly Premium for a year might not be useful or beneficial for you in terms of economic perspective. Therefore, next you will have to decide if your task is worth $30 because Grammarly Premium costs $30 month. Grammarly Premium is worth it. Here are some Grammarly Premium reviews by customers on Reddit. Is Grammarly worth the money paying for? It's ok, but to me it's mostly useful for emails and the like. It doesn't handle large files well. Overall, I prefer Autocrit - has a LOT more functionality, handles large files (though it churns for a bit, it WILL still handle them), and it doesn't police your every internet comment like Grammarly will. English is my second language, and Grammarly helps me a lot. It points out more mistakes than MS Word ever could and also explains the error (or the perceived error. It's not fool-proof). It helps with spelling, grammar, punctuation and highlights possible stylistic issues, like word repetition, passive voice, and so on. I also like the Chrome plugin, although it can be a bit laggy. It's not perfect and can't replace a human editor, but it's a very nice tool. To me, it's a business expense well worth the price. I've been using Grammarly for a while. I tried the paid version, but to be honest the free service is good enough for me. I don't use it for extensive proofreading (like for complete novels), but for everyday use is more than enough - the paid version simply doesn't add enough features for me to make it worth buying. You can try it for free and see what you think of it yourself; also they often have deals with 40% (or more) off from the full price so I'd suggest you wait to buy from full price especially the first time. Personally, I don't think any grammar or writing algorithm is a good idea. At best, they'll help you develop a pathological style. Your writing may become palatable, but you'll never flourish as a writer. Developing writers should challenge themselves to venture out into the wilderness of the English language and come back with a bit of it they've made their own. A grammar app deprives you of that challenge. By all means deploy the lessons of great writers and technical experts in your work. But don't do it in an automated, default-prone way. You'll never develop the self-reliance and ingenuity you need to fashion real prose; you'll just become a less efficient algorithm. I have used several tools like Grammarly before. Some are Ginger Software, Hemingway, Crio by Stanford University, Paperrater, etc. However, not most of those tools provided tools similar to Grammarly. Hence, I stuck with Grammarly.com. If you are looking for a more straightforward grammar checking tool, Grammarly is good. However, if you are looking a tool for creative writing or professional writing such as sales copy, Grammarly might not be your best choice but a professional human proofreader which you can hire on freelancing network like Freelancer.com, Guru.com. There are several Grammarly competitors out there. However, not all of them are powerful and accurate grammar checker tools. Some are just third-party apps that are promoting another affiliate product while others are typical, outdated proofreaders. Here is a small comparison of Grammarly, GingerSoftware and Whitesmoke proofreading tools. Ratings are based on the performances of complete grammar checking abilities and other common and unique features. Overall, Grammarly is a robust proofreading app. Its free version is enough to check basic grammar and punctuation errors even though Grammarly Premium gives more features and unlocks awesome tools for writers. Ginger is a Grammarly competitor and a good alternative. If you are looking for a basic tool to check grammar on different languages apart from English such as Spanish, Italian and Dutch, Ginger would be a good candidate. Grammar checker, plagiarism checker, translator (up to 55 different languages) and mobile apps. WhiteSmoke is a thorough grammar checker software with awesome features. However, there isn't a free plan available as of now. Check out this Grammarly vs. Ginger comparison article to find which proofreading tool between Grammarly and Ginger is best for you. Just saying, it's not entirely safe to use Grammarly for your works. Grammarly is committed to protecting the security of your information and takes reasonable precautions to protect it. However, Internet data transmissions, whether wired or wireless, cannot be guaranteed to be 100% secure, and as a result, we cannot ensure the security of information you transmit to us, including Personal Information and User Content; accordingly, you acknowledge that you do so at your own risk. Clear your browser cookies once a while to stop Grammarly ads and remove Grammarly browser extension for further security. Grammarly allows using one account on up to 5 different devices at once. For example, you can log in to one Grammarly account on your Desktop, Laptop, Tablet, smart TV and smartphone at once. Learn more about using Grammarly on multiple devices over here. Grammarly is a grammar checker online software, and it's based on the cloud so you can use Grammarly on any device even without downloading software. For specific cases, you may install apps provided by Grammarly. However, it is not needed to install any software to use Grammarly. When you type something, they are sent securely to Grammarly servers located at United States over SSL connection. In this Grammarly review, I tried to answer as many questions as possible. However, I see in many place people asks more specific questions. So, I answered some of common questions about Grammarly proofreader. Yes, Grammarly has a free plan. Grammarly free plan lets you correct basic grammatical and spelling error on your writings. You can also install free Grammarly browser extension over here and proofread anything you type on Internet. From my experience, Grammarly can't replace a professional proofreader. Especially if you want to proofread your longer documents, marketing copies, sales copies, email copies and even your book, then I would recommend using a professional proofreader over Grammarly. Yes, Grammarly provides mobile applications for both Android and iOS. Alternatively, you can always login to your Grammarly dashboard on your mobile and use the editor to type and proofread documents, emails etc. No. You will have to copy and paste the text in PDF into Grammarly Editor to proofread. Grammarly is useful at its best! Every time someone is typing while using Grammarly’s Chrome extension, web app, or MS Office plugin, the company is collecting data they can use to make its product better. The latest application of this is the launch of Grammarly Insights 2.0. Insights sends users a weekly trend report about how they write, which includes everything from vocabulary metrics to productivity. In the future, Grammarly might use machine learning not just to provide a better algorithm, but to deliver highly personalized recommendations to users. Currently, there aren't Grammarly free trials. However, if you want to try Grammarly, you can sign up to Grammarly for free or if you want to try Grammarly Premium for free, enter monthly Grammarly Premium giveaway contest above. There is not a direct way to get Grammarly Premium for free. However, you can sign up for Pitiya Grammarly monthly contest over here to win Grammarly Premium account for one year for free. As a non-native English speaking blogger since 2012, I relied on Grammarly heavily for proofreading my blog posts, emails and social posts. Not only Grammarly helped my blog posts to be error-less, but also improved my English knowledge so day by day after using Grammarly for works, I started seeing improvements of my English writing. Grammarly won't expose most advanced grammar and writing errors if you are using the free plan. However, Grammarly Premium checks context-based grammar and writing errors and suggest corrections along with explanations. Once you installed Grammarly extension on your browser, you can overcome many headaches. Grammarly already integrates with blogging platforms like ​Clickfunnels, BlogSpot, Tumblr, Medium, and Foursquare and all social networks, forums and web page builders like Clickfunnels. Grammarly also integrates with Google Docs through browser extension. For Microsoft Word, they have addons which you can download for free on your Grammarly dashboard. In this review on Grammarly, I tried to show you how I use Grammarly grammar checker and key benefits of it. However, none of writing tools is perfect. There are hiccups in every tool out there. Here are the pros and cons of Grammarly.com I found. Share your review for Grammarly at the comments below. As a grammar checker tool, Grammarly provides many tools for every type of needs in writing. I have listed some benefits that I found very useful above. Here are several Pros of Grammarly. Better than Microsoft Word: I have written hundreds of articles on Microsoft Word. But, it only fixes a few grammatical errors. But, Grammarly can correct over 250 types of errors on any paper. It’s much better than MS Word. Availability: As I explained before in this Grammarly review, you can proofread any article you write anywhere with Grammarly. It's cloud-based software that means you can access your account 24x7 on any browser and start correcting any paper, report or letter in a matter of minutes. Grammarly extension for your favorite browser will make your life more comfortable than ever. Plagiarism checker: If you are a blogger or a writer for magazines, blogs or run a digital marketing agency, you will love the free plagiarism checker that you'd receive along with Grammarly Premium. Grammarly Keyboard app: We all use smartphones. Don't we? Grammarly Keyboard app is one of the go-to-apps for users who are heavily doing business through mobile. Weekly progress report: If you write a lot and want to know your growth over time, Grammarly Weekly progress report will showcase your performance within the previous period and compare it with others and your old statistics. Those data-driven recommendations would encourage you to improve your grammar and writing as it did to me. Grammarly is a thorough writing aid tool, not a teaching software that helps your grammar. However, there are several downsides of Grammarly. Share your review on Grammarly at the comments section below so I will list them in here. Undo function is disabled in MS Word: One big reason why we use any proofreader tool is to fix our grammatical mistakes. If you enabled the Grammarly Add-on in MS Word to check grammar, undoing is disabled by default. The auto-save function is disabled in MS Word: Auto saving is another vital function of MS Word we all love. But, if you enabled Grammarly Add-in, your content won’t save automatically. So you have to manually keep the article clicking the ‘Save’ button or pressing CTRL + S keyboard shortcut keys. Pricing: Grammarly offers both free and premium plans. To get more features and tools, you have to upgrade the premium plan. Grammarly premium has three billing options: Monthly, Quarterly, and Yearly. If you are on a budget or only want to check grammar on one paper, for example, choosing the monthly billing option could be more disadvantageous for you. The best thing about Grammarly is that not only it corrects the errors in your articles, but also explains the reasons why your grammar is incorrect and gives a clear explanation using examples and linking to reliable references such as Wikipedia. If you want to improve your writing skills, check for plagiarism and find the meanings of compound, unknown words, I recommend you to use its free version at least. Do you already use Grammarly to make error-free articles? If so, share your personal experience with me and others to know more about it. Grammarly is a good solution for people who work with content regularly. As a Proofreader, Grammarly provides various tools and functions to make your online article error-free ones. If you want just more than checking grammatical mistakes, then you should definitely take a look Grammarly online grammar checker. Thanks Samuel for your response. Your feedback always help me to write more content. Looking forward to hearing more from you. Great article. I love Grammarly so much. It is helping me in fixing grammar errors and making my article errors free. Language Acquisition is a big challenge, articulating what I feel seems hard in English but with Grammarly, it is easier than ever. I love grammarly! I am an editor and it makes my work so much easier. It is easy to install on any browser and works whether I’m writing an email, using word, or typing a response on the internet! I love Grammarly! Grammarly has been so helpful when writing business email since I work in United States, it has helped me so many times of correcting horrible mistakes. I am an online ESL teacher and think Grammarly would be a huge benefit to my students learning English. Grammarly is such a robust tool! Thank you for providing all this information.